The 1 and 2 balls are frozen even with the tip of the side pocket at the angle indicated by the dotted line. The 3,4 and 5 balls are in a straight line with the 1 ball and spaced apart as suggested by long dotted lines. Freeze a ball to each of these balls dead along the same lines. 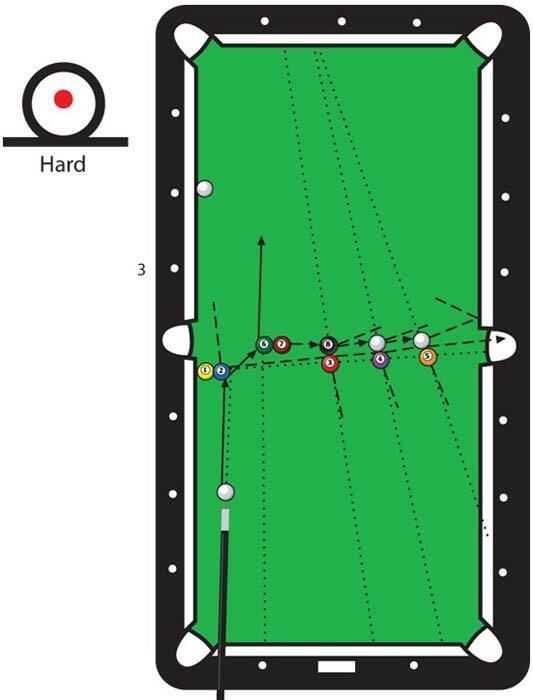 The 6 and 7 balls are frozen one diamond out from the left rail and dead to hit the left side of the 8 ball. (See Diagram). Place the cue ball two diamonds back but in line with the egde of the 2 ball. Hit the cue ball hard just a little above center aiming the 2 ball at diamond no. 3. The cue ball must hit the 6 ball full. The balls open up like a football play, and the 1 ball banks straight across the table into the right side pocket.